How many times have you passed up voiceover opportunities because you didn't have a home recording studio? 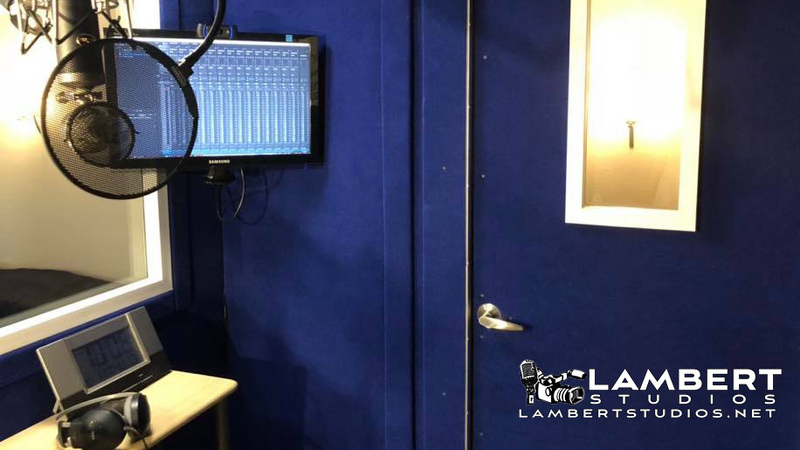 Maybe you're a podcaster and need a place to record. Maybe your own home studio just isn't quiet enough and you have a new client you want to impress. Or maybe you don't have a phone patch or Source-Connect for remote sessions. Now you can rent ours for a very low hourly rate! We have everything you need from facility to equipment to production elements like music beds & sound effects so you can create a professional-grade deliverable for your clients. You just show up and record! Please note! We do not record music! Voiceovers only! Our facility includes a comfortably air-conditioned 6'x8' noise-cancelling isolation booth custom built by VocalBooth.com equipped with your choice of a Neumann TLM-103 condenser microphone, a Blue Baby Bottle, a RØDE NTG-2 shotgun microphone, two AKG Perception 200's, and one AKG C3000B. Our DAW (Digital Audio Workstation) consists of a custom-built PC with a liquid-cooled Intel i7 6900K 8-core/16-thread CPU with 64GB RAM, solid-state boot drive, Nvidia GTX 1070 video card with 8GB RAM, an 8-channel Focusrite Saffire PRO 40 digital audio interface, and an 8-track Mackie Control Universal control surface. Installed software includes your choice of Adobe Audition CC or Audacity. Note: You must be familiar with Adobe Audition CC or Audacity. We cannot provide instruction other than basic orientation relevant to how our system is configured. Schedule your appointment online by clicking here. Once you arrive, you'll receive a brief orientation on our setup, where to save your files, etc. Then we turn you loose! You can record and edit on site or you can record, then take the files with you to edit at home on your own software. In any case, we ask that you bring a flash drive with you to save your files. We will hold on to your original files as a backup for 30 days. If your client wants you to patch into their console, you may use our Source-Connect account. Just be sure to obtain your client's username before you arrive for your session. Source-Connect NOW is also available if your client doesn't use Source-Connect. It works exclusively with the Google Chrome browser. There's also a standard phone patch available. Need a hand? We can supply an engineer for an additional fee. You can book your session in 1-hour increments. All sessions must be secured with a credit card. We do not carry cash nor are we able to make change. Additional time/services (if applicable) will be due upon completion of your session.